Guest article by Kristen Carney and Aaron Herman of Cubit. Finding land use land cover data is a pain. Unless your project is within an MPO/COG that has historic and current land use shapefiles that are easy for your GIS guru to access, you can be up a creek without a paddle when it comes to finding good land use data. 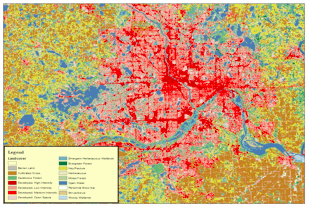 Despite the data challenges, many planners HAVE to have land use data for their projects. For example, over 90% percent of transportation environmental impact statements address land use impacts in their indirect impacts analyses according to this unscientific survey. 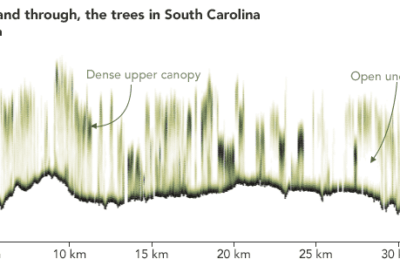 So what should you do if your project is in an area that doesn’t have local land use data? Or what if you have a giant project area and the land use data set for one area doesn’t jive with the land use data set for another area? If you can’t find good land use data from the typical local venues (I’ll blog about “typical local venues for land use data” next week), check out the US Geological Survey’s 2001 National Land Cover Data Set (or USGS NLCD 2001). 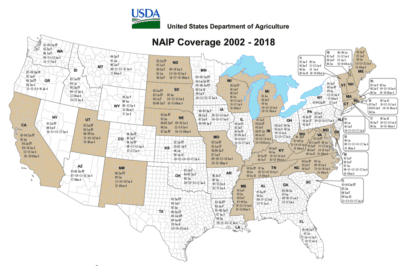 The USGS 2001 National Land Cover Data Set is the latest, most accurate, nearest-to-complete and standardized land use coverage for the entire United States. 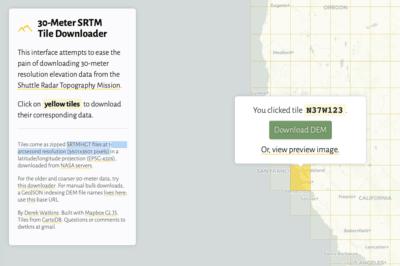 Yup, you can get land cover data for the whole USA enchilada. There is a USGS NLCD 1992 data set. And the land use experts over at the Multi-Resolution Land Characteristics Consortium are working on a USGS NLCD 2006 data set. You can use these USGS National Land Cover Data Sets to visualize land use changes over time. The data is provided as a image. While it’s possible to convert the image to acreage estimates, it’s technically difficult to do and would involve custom scripting. 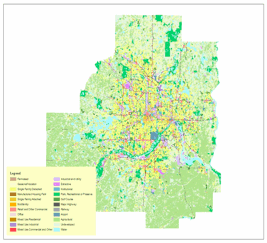 Let’s compare the land use data provided by Twin Cities’ Metropolitan Council and the USGS NLCD 2001. I was able to download Generalized Land Use 2005 data from the Metropolitan Council for the seven-county area. For comparison, displayed below is the USGS 2001 National Land Cover data for roughly the same area. These images are pretty small–if you need bigger images or want more information about land use land cover data sources, scroll down to the end of the blog post where you can get more information in a pdf. You can get much more specified data with the local Metropolitan Council data set. For example, I can determine Single Family Attached versus Single Family Detached versus Mobile Homes using the Metropolitan Council’s data. 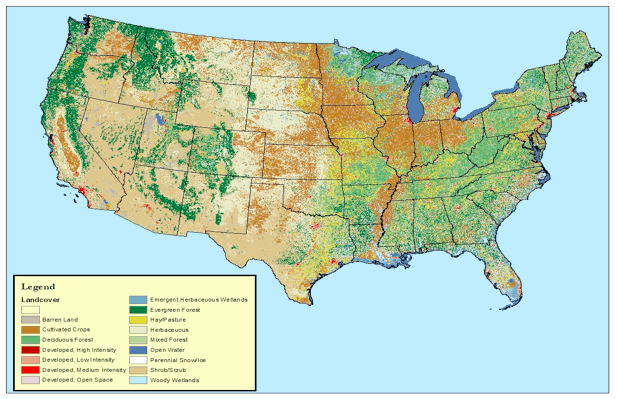 The USGS 2001 National Land Cover data provides generalized data on Developed High Density, Developed Low Density and Developed Medium Density. But not every project area has good, accessible land use data like the Metropolitan Council data. And that’s where USGS 2001 National Land Cover Data comes in handy. If you have a small project in an area that has good local land use data, local data is your best bet. If you have a large project area (think multi-county, multi-MPO/COG, especially multi-state) or you can’t find good local data, then check out the USGS 2001 National Land Cover Data Set. Kristen Carney is one of the founders of Cubit, a firm that specializes in “cut-and-paste ready planning data”. Aaron Herman is a fledgling GIS professional with a BS in Natural Resources Planning from Humboldt State University in Arcata, CA and an online post-baccalaureate certificate in GIS through Penn State University. If you need more information about where to get land use land cover data, Aaron Herman researched and wrote an excellent whitepaper on the subject. This blog post is based on his research. If you want a pdf of his whitepaper, contact us here and we’ll send it to you. If you enjoyed this blog post, you should check out Cubit–our web application that helps you get cut-and-paste ready planning data in seconds for your projects.